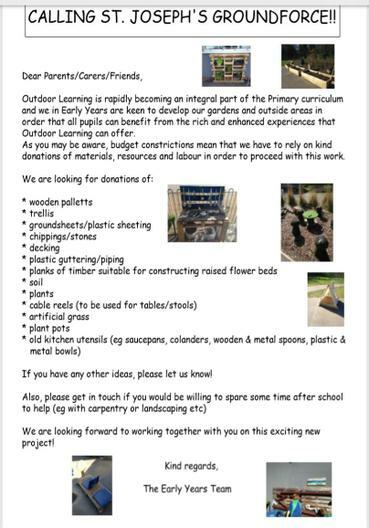 Outdoor Learning is rapidly becoming an integral part of the Primary curriculum and we in Early Years are keen to develop our gardens and outside areas in order that all pupils can benefit from the rich and enhanced experiences that Outdoor Learning can offer. As you may be aware, budget constrictions mean that we have to rely on kind donations of materials, resources and labour in order to proceed with this work. If you have any other ideas, please let us know! We are looking forward to working together with you on this exciting new project!